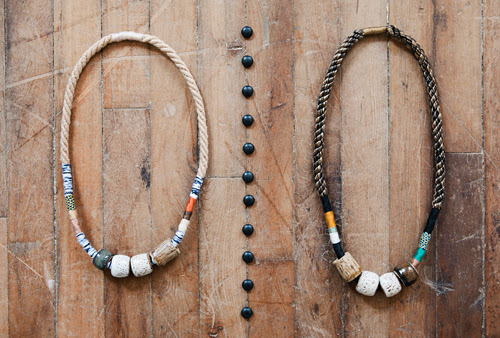 one of my favorite finds this season is my object & totem necklace (if you follow me on instagram, you know i've been wearing it pretty much nonstop). this month's conversation is with Julie – the lovely and über-talented lady behind the designs. I'm Julie, and I'm an Artist and Designer working in ceramics and fibers. Born in Pennsylvania and now living in Berlin after living in Philadelphia for 5 years. 1. as an artist, your background and work spans a variety of media. how did you get into clay? what draws you to it as a material and method? In 2010 I was laid off from my job so I decided to enroll in a beginner's wheel throwing course at the local Clay Studio in Philadelphia. What drew me to clay was curiosity and the feeling as if I couldn't really lose anything. Looking back it's easy to see how much I needed it at the time - the process of controlling an incredibly vulnerable material and finding something coherent, solid and tangible in the end was the perfect solution to a fresh start. 2. a friend bought one of your necklaces, which is how i initially discovered your work (and i've been a fan ever since!). how did you come upon the idea of making jewelry? Making beads was sort of an extension from the ceramic wares, and I thought the best I could bring to the table was fusing processes together like cording and turning and make something I'd want to wear or hang on the wall. 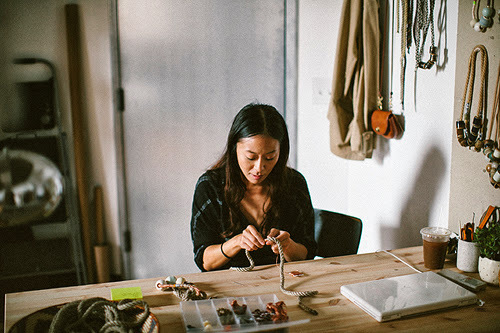 3. even though we're living in the age of Fast Fashion and globalized big box stores, there has been a wonderful makers movement that has emerged in recent years. how do you feel about creating by hand? what's your working process? I feel I'm part of a history of makers who have always existed on both ends of the fast fashion spectrum. I love making and never feel as though I'm making anything for the sake of itself. Making something can feel like creating one giant knot and then taking the time to untangle it until it's a straight line again. For me, I find a lot of gratification in the process. Time varies piece to piece, but I've definitely had sleepless nights and bouts of tendonitis. 4. how would you describe your personal style these days? how has your aesthetic evolved in the past decade? I think my style now is something along the lines of a homeless Pablo Picasso. I have a lot of stripes, comfy linens and neutrals. I used to wear a lot more patterns, but now I like to simplify how I pair pieces together for more practical reasons - one being, everything gets covered in clay or dust - the other reason is that I ride a bike and walk a lot everyday so I just can't be that jerk running to studio in high heels and then coming home looking like I fell in a ditch. 5. does your background in art + textile design influence your approach to clothing / shopping? If you majored in Textiles as an undergrad like me, then you'd probably understand a typical day of shopping would involve something like going into a store, going up to a sweater with an attractive texture, rubbing your fingers against the fabric and then looking to see the fiber content to make sure it's either 100% cotton or wool (or maybe cringe a little if it's acrylic). 6. do you have any wardrobe essentials / a style uniform? what do you wear when you're working in the studio? on the weekend? I've been wearing the same "jail" outfit to studio the entire summer - denim shirt and boyfriend jeans. There's always an attempt to be very feminine on the weekends, but I somehow manage to ditch the dress for some trousers. An average working day for me is waking up, making breakfast, going for a run around the park and then getting ready to head to studio on my bike. Then I listen to German radio for at least six hours while I work and hope that some vocabulary has sunk in. There's a slow pace in Berlin which is nice. Working in clay makes for all sort of interesting days so you never know how your day will end up, whether you're just starting on something or have to figure out how to fix something you want to finish. I have a 50/50 Hip Marriage Project cotton tote which donated most of the profits to organizations supporting gay marriage. I always like to carry my sketch book, pencil, some kind of snack and a baggu bag for daily grocery shopping. 9. since your recent move, what are your impressions of Berlin? how is your new studio coming along? do you have any new plans for your collection? 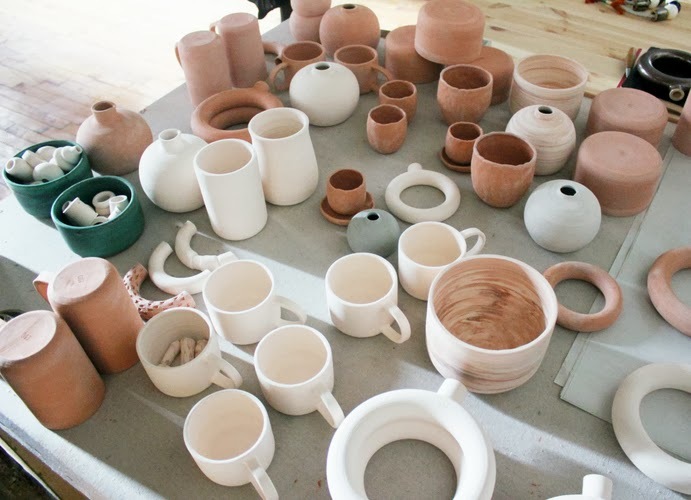 I'm renting a studio within a studio in Prenzlauer Berg from Jeanne Koepp who has been a ceramicist and midwife in Berlin for 15 years. It was incredibly difficult finding any space at all and the language barrier didn't help. Now that I have a space, I'm trying to finish pieces I began making earlier this summer. All the resources are new to me so I'm learning to adapt as much as possible while trying new things. I may sell some hand built jewelry soon depending on how they turn out from the kiln, but I've learned to stop planning, because there's always a monkey wrench that gets thrown in the middle of it, or so I've experienced since moving. 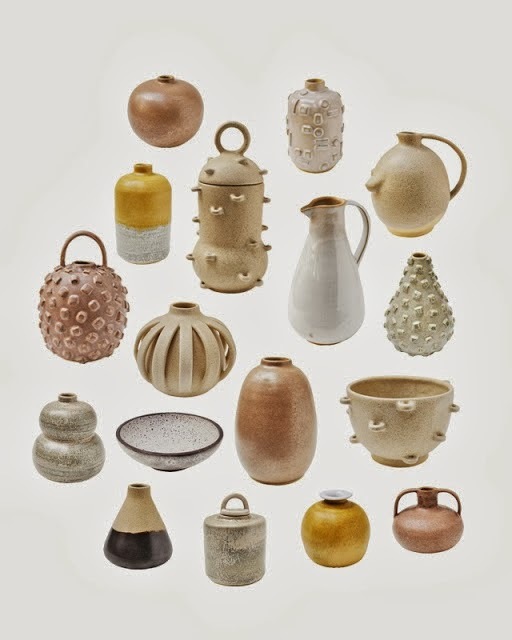 I suppose it goes back to the integrity of making as the core behind what I enjoy about working with ceramics and maintaining a sense of respect for what you learn from the medium. If you've ever seen the scout video of Josh Vogel of Black Creek Mercantile, you'll understand what I mean. He has a wonderful perspective on how the life of the material informs himself as a maker, and I just hope to do the same. Wonderful interview. Love her vases. I loved this interview. I want one of her necklaces, but they are harder to track down these days. 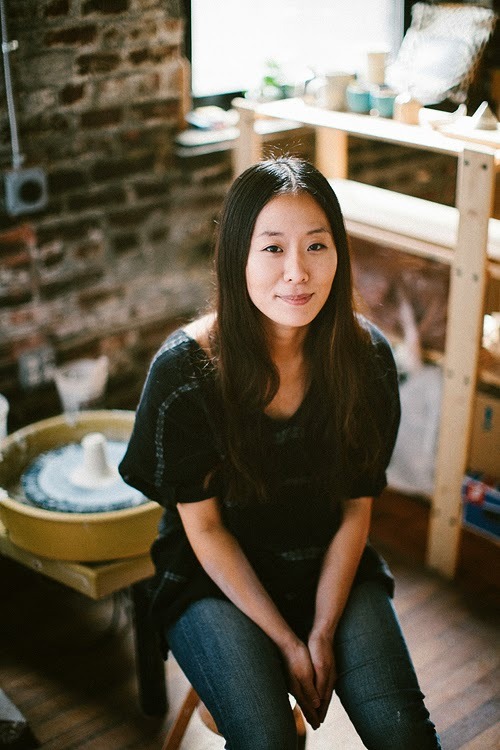 Her work is lovely, I especially like the ceramics. I like her instinctive approach to making things, as opposed to creating collections to sell every season. interesting to see an artist interviewed. thanks for changing things up a bit. Great interview! Her new pieces look so fantastic. This also rekindles my desire to sign up for a ceramics course! I really enjoyed the interview - Julie´s pieces are one of a kind and very nice!